This feed provides highly digestible ingredients to support proper digestion and is nutritionally balanced eliminating the need for expensive supplements. Pellets are easy to transport, feed and store and the ingredients appeals to even finicky horses for consistent intake. This feed keeps breeding stallions on a high nutrition plane and has enhanced amino acids to support fetal development and milk production in mares. The vitamins, minerals and protein found in this feed help promote strong bones, tendons and muscles. The energy source promotes level temperament and lessens digestive disturbances in horses. Polyunsaturated oils help improve the overall appearance for shinier looking horses. High quality protein and enhanced amino acids help performance horses recover from training. You will be able to see the development in young horses and strong muscle maintenance in performance horses as well as fetal development. 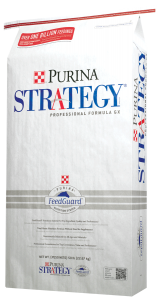 For more information and feeding guidelines regarding Strategy Professional Formula GX by Purina, click here. Stop by Mansfield Feed Mill for all your horse care needs. This entry was posted on Wednesday, August 31st, 2016 at 4:59 pm	and is filed under News & Updates. You can follow any responses to this entry through the RSS 2.0 feed. Both comments and pings are currently closed.